I am writing my Master thesis in Latex (Texstudio). I need to draw a lot of molecules and want to number them throughout the whole thesis. For some strange reason, the package chemnum isn't working. 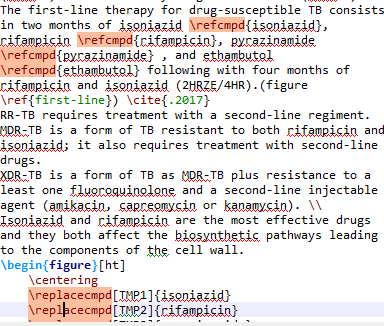 The commands are highlighted in red when I compile the file and the output isn't the right one. I really need that package. I have even checked the chemnum.cwl in the autocompletion list in the settings to get recognized in every document but that doesn't help either. Browse other questions tagged texstudio chemnum or ask your own question. How to put compound names in braces globally with chemnum?